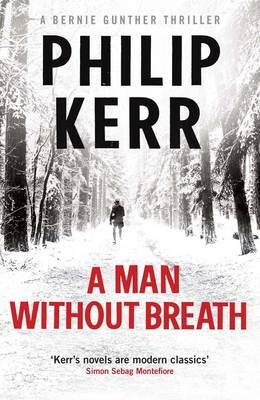 You can read my review of Philip Kerr’s latest Bernie Gunther thriller A Man Without Breath at Euro Crime. This novel should be a strong contender for the CWA Ellis Peters Historical Crime Fiction Award simply for its educational value in being informative about some of the terrible events that went on in Eastern Europe, before and during World War II. Yet another novel that makes me very grateful that my great grandparents, and grandparents had the foresight to take a boat trip west in the 19th and early 20th century. Norman – I will confess I’ve only looked briefly at your review as I intend to read this soon myself. But as always your review looks excellent, and it’s good to hear that this maintains Kerr’s high quality of work. I keep getting geared up to read one of these books or Rebecca Cantrell’s, especially the one about the 1936 Olympics. Then I read something, as the obituary of a 95-year-old rabbi who just died, and was the first person to enter Buchenwald and tell the survivors they were “free.” It was a very moving piece, which sent me to look up some facts, which then convinced me that I don’t need to read of more horrors. Some day I will. Yes, your relatives’ foresight to leave Eastern Europe was good, as was their decision to arrive in England and not a few other Western European countries. repression. In 1918, Poland became independent once again, only to have to deal with German militarism not too much later. My relatives were fine, not so their countrymen and women. But we know what happened there.